When it comes to First Year Adviser Alex Watters, staying in one place is something he typically does not do. From working every day helping students grow through their first year at college, to being a member of the Sioux City city council, to helping lobby for helping disabled youth, Watters keeps a pretty tight schedule from day to day. A typical day for Alex begins at 6:00am, when his caregiver comes to help him begin his day. Once he’s ready, goes to his city council meeting at 7:30. After the meeting, he heads to work at the Krone Advising Center at 9:30, where he spends the day working with students and attending other meetings. According to Alex, what he loves most about the job is” to see them (his students) blossom and to see them come into their own.” He finishes work at 5:00 pm, but his day is not over just yet. On this particular day, Alex had an awards ceremony to attend at 5:30. Afterwards he has a call for the State Rehabilitation Council. Free time for Alex is not a common thing, but when he does have free time he likes to have fun. He loves to watch movies, go to beer festivals with his girlfriend as he is a fan of craft beer, seeing his students at Morningside events, and considers himself a foodie. Additionally, Alex is currently working on a book, which he currently calls “Living the Dream, Just Not the One I Imagined.” Along with the book, he hopes to be a motivational speaker in the future. The last person I talked to was my roommate, Levi Swan. He is a 19 year old Caucasian male. Small build. Has Straight, dark brown hair. Around 5′ 9″ tall and weighs around 115 lbs. Still has braces on his upper set of teeth. He was wearing no shirt and wearing dark colored gym shorts and glasses. The last conversation I had with him was about how game publisher EA stopped making NCAA video games a long time ago, as he was playing an NCAA basketball game on his Xbox. I was given a small selection of goodies. The first food item I received was two chocolate doughnut holes. They were a deep dark brown color and was liberally coated with sugar. Feeling these doughnut holes, you could tell that these were very soft and dense, unlike some doughnut holes which can be crispy on the outside and light on the inside. When touching them, a small layer of sugar came off onto my fingers since there was simply so much sugar. They have a subtle cocoa scent to them. When biting into them, you could definitely experience the density and cocoa flavor of the doughnut hole, along with a nice sweetness and a satisfying, slight crunch sound from the sugar. The Next item I received was a small selection of mixed fruit. This included a strawberry, a blackberry, a raspberry, and two blueberries. The strawberry did not look as fresh as I would like it to be, as there is some slight discoloration throughout the berry. Biting into the strawberry, it was very apparent. The taste was fairly bland compared to a normal strawberry, and was also slightly sour. The next fruit to try was the blackberry. Upon picking it up, it was very squishy and even a slight touch caused it to leak juice. When biting into the fruit, I was surprised by the amount of seeds that were in it. Along with the strawberry, it as well had a bit of a sour flavor and could’ve been sweeter. Sometimes when working in the post office, you might not know exactly what’s going on in the outside world today. Today when needing some information about the weather, it occurred to me that I had a package I needed to pick up from the post office. 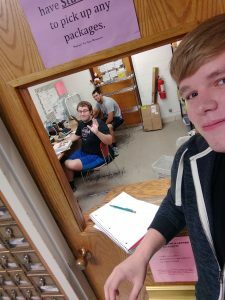 While I do not know post office worker Zach Hutchison very well, I have had a class or two with him in the past, so when we do see each other there usually is some conversation between us two. Today when picking up the package, I figured I would ask him about the weather. When I did this, he gave me a confused look and simply said, “It’s warm, I think.” He then proceeds to look up the weather on the post office computer and admits to me that he actually had no idea what the weather was like outside. After looking up the weather, he told me, “I’d rather it not be 89 degrees outside.” This is because Fall was his favorite season and has been awaiting Fall weather since classes started. When asked for the required selfie to commemorate the exchange, Zach was more than happy to take one with me. After collecting my mail, I decided that I wanted more. I wanted the opinion of someone who was actually outside and getting to enjoy the weather. On my way back, I ran into freshman Skyler McDermott, who was walking across campus with a smile on her face and pep in her step. When I asked her how she felt about the weather today, she told me, “It’s beautiful! Except it’s supposed to get hotter today and I’m wearing jeans so it’s not going to be very fun.” When I asked for a selfie to commemorate our encounter, she refused and continued on with her day. As someone who is generally an outgoing person, doing things like this are not too hard for me. I was a little heartbroken that Skyler refused to take a selfie with me, but you can’t win them all. In the article I read, it stated that North Korea has fired another missile over Japan. This now makes the fifteenth missile test North Korea has conducted this year. It comes after the United Nations passed sanctions against the nation, which North Korea threatened retaliation towards. The missile landed 1,200 miles east of Cape Erimo. As someone who has currently been following the rising tensions between North Korea and the United States, this is slightly concerning me. While I don’t believe anything bad will happen, the amount of missile tests they have been conducting lately has been giving me a lot of reason to concern. My one complaint with the article is that there isn’t much of a lede to get me hooked into the article. After a group of students had their boat capsize off the coast of Daytona Beach, one was killed and another was injured. Four students of the Armstrong Aeronautical University in Daytona Beach, Florida- went sailing in a 16-foot catamaran. 19 year old Randy Cohen reported that the boat capsized after springing a leak. The four students were left hanging on to one of the boat’s pontoons through the night with strong currents and without life jackets. They began swimming towards the shore of Ormond Beach at dawn. When swimming back, Cohen heard a call for help from 19 year old Christy Wapniarski, who was being attacked by a shark. By time Cohen was able to reach Wapniarski, she was unconscious with no shark in sight. 20 year old Daniel Perrin swam to aid Cohen and Wapniarski. After checking her pulse, Perrin told Cohen that she was dead. Cohen still swam with Wapniarski for another few minutes until he had to let her go due to exhaustion. The three remaining students took six and a half more hours to reach the shore. While swimming back, Cohen was bitten several times by Portuguese men-of-war. He currently is in Halifax Hospital, Daytona Beach. The other two were examined at the hospital and later released. 42 were killed and 16 injured after a United Airlines flight crashed in Chicago. The National Transportation Safety Board in Washington were immediately dispatched to the scene in Chicago. In their investigation, 42 bodies were found. One of the victims was identified to as Representative George W. Collins of Illinois, who was returning to organize a children’s Christmas party. 16 others, including the three flight attendants, were admitted to Holy Cross Hospitals with injuries. With the worry of academics, obligations with extracurricular activities, financial difficulties, family affairs, and the constant rush of life; college can be a very stressful time. For many first year students, college means a new world of freedom. Additionally, this is the first time they have been responsible for making sure they show up to their classes on time, the first time they have been responsible for making their own money and using it wisely, and even the first time they have had to study regularly for their classes. These new responsibilities can lead to stress first year students may have never experienced before. US Today reports that 85 percent of students have been overwhelmed by their work at some point. The same study also reported that “30% of students have reported that stress had negatively affected their academic performance.” Much of this stress comes from having to get used to an unfamiliar environment, the larger workload from their classes, and having to continually plan for their future. All of this stress can truly take a toll on the student in multiple ways. According to a study conducted by the Anxiety and Depression Association of America, “70% of those who report persistent stress have trouble sleeping.” A lack of sleep can lead to difficulties in listening, learning, problem solving, concentration, and memory. Stress and a lack of sleep can result in students to have issues learning and studying, which can in turn have negative effects on student grades. A Mayo Clinic report also reported that stress can lead to irritability and anger, which can in turn be detrimental to relationships between fellow students and teachers. Morningside offers ways to reduce stress in students as well with a massage chair in the health center, occasional puppy petting sessions, and constant fun activities to take students’ minds off stress. Additionally, students should exercise regularly, practice good sleeping habits, limit or eliminate the use of caffeine or other stimulants, and realize and work within their physical limits. For many students, the stresses of college can be very overwhelming. With the worry of academics, obligations with extracurricular activities, financial difficulties, and other stresses; college can be a very stressful time. For many first year students, college means a new world of freedom. Many students will be living on their own for the first time. They have free time they may not have had before. Along with this new freedom comes new responsibility. For many students, this is the first time they have been responsible for making sure they show up to their classes on time, the first time they have been responsible for making their own money and using it wisely, and even the first time they have had to study regularly for their classes. These new responsibilities can lead to stress first year students may have never experience before. US Today reports that 85% of students have been overwhelmed by their work at some point. The same study also reported that “30% of students have reported that stress had negatively affected their academic performance.” Much of this stress comes from having to get used to an unfamiliar environment, the larger workload from their classes, and having to continually plan for their future. All of this stress can truly take a toll on the student in multiple ways. According to a study conducted by the Anxiety and Depression Association of America, “70% of those who report persistent stress have trouble sleeping.” A lack of sleep can lead to difficulties in listening, learning, problem solving, concentration, and memory. This can cause students to have issues learning and studying, which can in turn have negative effects on student grades. A Mayo Clinic report also reported that stress can lead to irritability and anger, which can in turn be detrimental to relationships between fellow students and teachers. While stress is inevitable, there are many ways to prevent and relieve stress. One of the best ways to reduce stress according to Campus Mind Works is to “Try setting a specific goal for yourself that will improve your mood and help you reduce stress.” Morningside offers ways to reduce stress in students as well with a massage chair in the health center, occasional puppy petting sessions, and constant fun activities to take students’ minds off stress. Additionally, students should exercise regularly, practice good sleeping habits, limit or eliminate the use of caffeine or other stimulants, and realize and work within their physical limits. The suspension of 5 students at East High School has lead to protests and unrest within the school. East High Principal Laura Vibelius reported that there was general unrest from disgruntled students last week after five students where suspended for smoking marijuana in the school parking lot on Monday. On Tuesday, students started a food fight in the cafeteria. In addition, three false alarms were sounded on Wednesday. When asked about the protests, Principal Vibelius commented, “Not so much unrest because of suspensions, but because of summer vacation being so near.” An additional ten students were suspended for a week due to the demonstrations. Vibelius also commented that she sees no continuation of these “incidents” in the future. In an article I found while scrolling around on Reddit, a Massachusetts library is having to release a statement reminding library members through Facebook that tokens from Chuck-E-Cheese and Bonkers cannot be used to pay their fines and printing costs. The Peabody Institute Library in Danvers reports that this summer they have seen a surge in patrons attempting to pay for their fines using tokens that are meant to be used to play games at Chuck-E-Cheese. When originally scrolling through Reddit, I thought this was just a post from The Onion, and then I realized that it was from the CBS station in Boston, so that this was an actual news story. The lede simply reads, “Chuck-E-Cheese tokens are for arcade games, not for paying your overdue book fines, one library is reminding its patrons.” When reading this on the Reddit post, I thought that this was just silly and I had to dig deeper into this.